With its spectacularly diverse ecosystems, rare and endemic species, remote terrain, often loophole-riddled laws and sketchy enforcement, Latin America is a haven for a booming illegal wildlife trade. South and Central America's diversity is a magnet for wildlife traffickers dealing in the rare and unusual. Brazil alone holds 15-20 percent of the planet's biological diversity and reportedly supplies 5-15 percent of the global illegal wildlife trade. What is most notable about this unlawful trade is the range of species involved. Birds -- particularly parrots, macaws and songbirds -- are among the most trafficked. Reptiles, including iguanas and snakes, are popular in the pet trade. Turtles are harvested for their eggs, meat and shells; caimans for their skins. Also striking is the immense volume and high prices obtained for illegally taken seafood delicacies -- ranging from shark fins, totoaba swim bladders, sea cucumbers and queen conch meat. A remarkable variety of other animals are also trafficked, including jaguars, armadillos, monkeys, frogs, scorpions and spiders. The breadth and complexity of the black market trade in wildlife complicates analysis of both its scale and scope. Assessments that exist tend to focus on a single country of origin, destination, class of animal or some combination thereof. Despite this lack of comprehensive data, a survey of media reports on cases in South and Central America and the Caribbean provides insights into, and some measure of, the trade's alarming dimensions. Birds are among the most numerous animals found on Latin America's black market. Top targets are parrots, macaws and songbirds. There is a long tradition in many Latin American countries, such as Brazil, Peru, Ecuador and Mexico, of citizens keeping birds as pets. This high domestic demand fuels a large portion of Latin America's illegal pet trade today. In Brazil, about 80 percent of trafficked animals are birds. Yet foreign markets are significant too, with Europe and the United States top destinations. 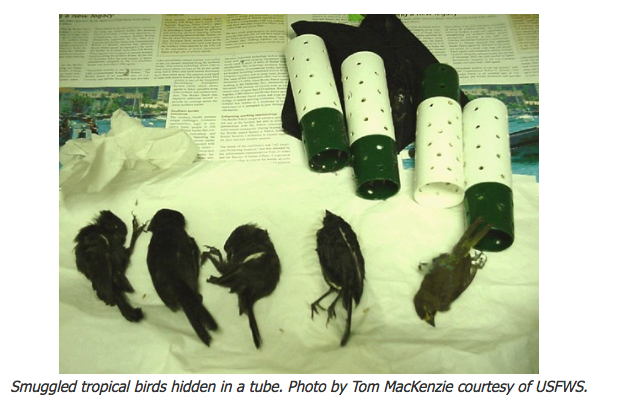 Songbirds, such as finches, are also illegally traded in both the domestic and international markets. They are especially valued for singing competitions where participants make money by picking winners -- the birds singing the most songs -- and "owners" earn cash from the sale of winning birds. The impact of the illegal bird trade on Latin American avian populations and ecosystems is devastating, and senseless, especially because up to 90 percent die in transit. Latin America's aquatic species -- including sharks, sea cucumbers, and totoaba -- are also targets of the illegal wildlife trade. Despite national restrictions in many countries, shark finning remains an industrial scale problem. In mid-October 2015, Mexican authorities seized 3.5 tons of dried shark fin, and in May 2015, Ecuadorian police seized 200,000 shark fins in the port city of Manta. Illegal trade in sea cucumbers is also a massive business. In June 2015, Ecuadorian authorities seized 10,852 sea cucumbers (262.8 kilograms or 578 pounds) at the San Cristóbal airport. That same month, Mexican federal police seized an illegal shipment of 17 tons of sea cucumbers at the Cancún International Airport, and in July 2013, they confiscated five tons in southern Mexico. Sea cucumber numbers have plummeted across Latin America, with the fisheries depleted on Ecuador's mainland coast and in the Galapagos Islands, and highly impacted in Mexico. Also threatened by the illegal trade is Mexico's totoaba, an endangered fish endemic to the Gulf of California, which lies between the Baja Peninsula and Mexico's mainland. Totoaba is valued for its swim bladders, used to make a specialty soup, and individual fish can be sold for $10,000 to $20,000 apiece in the Asian market. 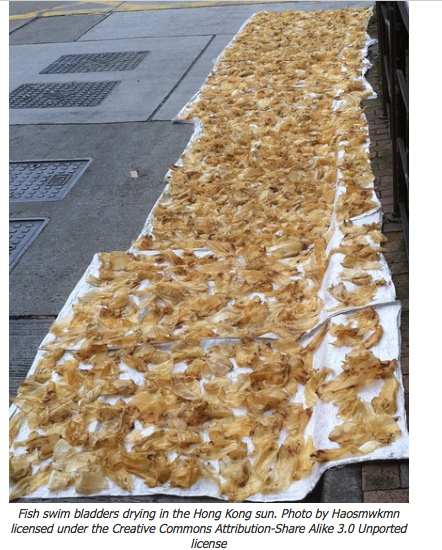 In July 2015, U.S. Customs and Border Protection officers in Puerto Rico seized 1,328 pounds (602 kilograms) of totoaba fish bladders inside 9 courier parcels delivered from Venezuela, destined for Hong Kong. While the true scope and scale of the South and Central American wildlife trade is unknown, evidence suggests it is large, and getting bigger. Brazilian NGO RENCTAS, the Brazilian Network to Fight the Trafficking of Wild Animals, estimated animal trafficking takes some 38 million specimens from nature each year in Brazil alone. 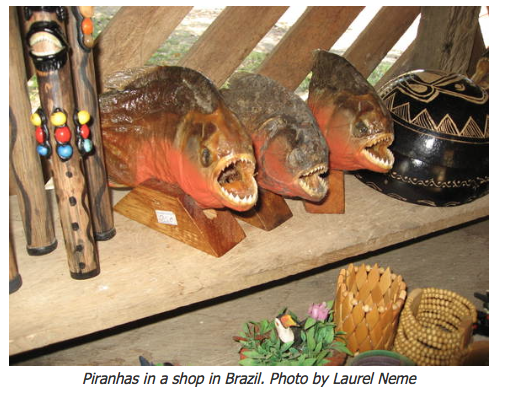 In Peru, 400 different species of fauna and flora are illegally traded. In Colombia, 58,000 trafficked animals are seized annually, and thousands of animals have been rescued in Bolivia, Brazil, and Paraguay, among other nations. Note: This is an excerpt of an article that originally appeared on Mongabay.com. You can find the entire article here. Follow Laurel Neme on Twitter @LaurelNeme or Facebook.